ESUSD’s academics rank in the top percentile of the state because of the dedication of the community and businesses of El Segundo. Our Annual Pledge Drive unites parents, grandparents, and supportive community members in their efforts to fund a complete and competitive education for all ESUSD students. Donations through your annual or quarterly/monthly installments guarantees Every Student Wins! Donations of $1,200 or more includes your family into the Superintendent’s Roundtable. As a SR member, you receive additional recognition as well as invitations to special events highlighting programs and current state of ESUSD in a smaller, personal setting. Over 120 Community Business Partners have already recognized the importance of investing in the future by supporting ESUSD. Donations from our Community Business Partners account for 44% of the ESEdF $1.5 million grant. Join our small group of esteemed partners who fund specific programs or curriculums. Ed! can work with you to identify a program that aligns with your company’s priorities. Implement a fundraising program specific to your business. 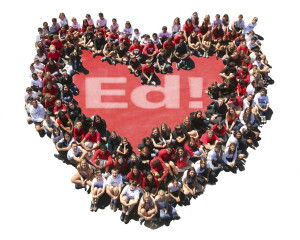 Submit a fundraising proposal to Ed! or work with the Ed! team to create an event or program that aligns with your business. Examples include a restaurant or retail outlet donating a percentage of sales. It’s a win-win for all involved. Become a BAC member. The role of the Business Advisory Council is to support and promote the Foundation by educating the public on its mission and to network encouraging prospective partners. The options are unlimited, and all help is greatly appreciated and thanked. Remember that Ed! consists of you! Help with office work. The Ed! office can use parent volunteers from time to time as well. Contact Laura Johnes to learn more. Join our Board of Directors. Our board is made up of ESUSD parents and non-parents with skills relevant to running a 501(c)(3) non-profit fundraising organization. If you would like to join our board, please contact Christine Sherrill, Board Development Chair. Volunteer at our Fundraisers. Each fundraiser requires parent power for jobs big and small. We’ll take any minute you can offer! Please contact Barbara Briney, Fundraiser Chair or Michele Rogers, Volunteers Chair.